These were the words of St John of God, who, in the 1500s, sought alms on the streets of Granada, Spain, for the poor and the sick that he helped in his ‘House of Hospitality.’ Five hundred years later, the Services of Saint John of God / Brothers of St John of God are following in his footsteps in central London, running a hostel named after its Cuban Brother, Blessed Olallo Valdes. In partnership with the Poor Servants of the Mother of God who donated the building, Olallo House was opened in 2008. Since 2012, Saint John of God Hospitaller Services has managed the ministry. Olallo House is a safe house for modern day slavery / trafficking victims, rough sleepers with no recourse to public funds (NRPFs), individuals on tuberculosis treatment, individuals discharged from hospitals without a “home”; and some of the most hard to reach individuals such as Roma, alcoholics and drug addicts - thanks to generous donations from individuals and Religious Orders to fund several beds. Having recently marked their first decade running the hostel, they are now making an urgent appeal for funds to improve what they can offer the most destitute, who are trying to rebuild their lives after sometimes years of being exploited by traffickers or on the margins of society / communities. Olallo House, just off a main London thoroughfare, is a refuge of compassion and hospitality where no one is turned away, and as mentioned even if they have “no recourse to public funds”. Victims of modern day slavery / trafficking often come straight from police stations where they’ve been taken after being rescued in police raids. Olallo House is driven by a philosophy summed up as: ‘Hospitality in the manner of Saint John of God’. Olallo House started as a street outreach project, with Brothers walking the streets of the capital to find the most vulnerable, such as homeless migrants from Europe living in derelict properties and building sites. Olallo House had to be more than just outreach and to be fulfilling its mission it had to offer a roof to the ones on the street. The Brothers soon understood that what these individuals needed was a safe place to restart. A second nearby property has opened which accommodates just victims of trafficking and a third safe house is about to open in north-east England. 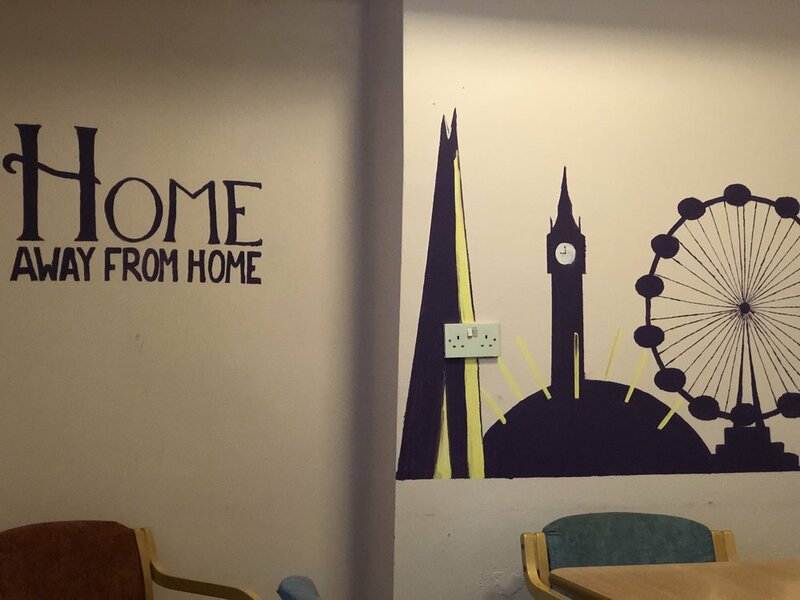 As briefly mentioned, another key aspect of Olallo House is that it offers a convalescent space for homeless people recently discharged from London hospitals. The “Pathway” charity started working with Olallo House so the many “homeless” individuals in hospital and “fit for discharge” would have a place to finish their treatment in ambulatory and not being let go with a big bag of medication into the streets. Olallo House also welcomes people in tuberculosis treatment. Individuals arrive in Olallo once they are no longer infectious from hospital settings. Due to the severity and strength of the medication there are undesirable side effects that Olallo House takes into consideration. In order to mitigate these a separate sitting room / quiet space and a kitchen is made available for those in treatment: “Our uniqueness is to work with those on the streets that no-one else wants” said Brother Malachy. Olallo House proudly boasts an 82% success rate – in other words, that’s how many of the clients leave with a job and a roof over their heads. They are sadly conscious of the others that don’t manage this which is often due to mental health problems, alcohol or immigration restrictions. For two years, Olallo House has been part of the National Referral Mechanism (NRM), sub-contracted by the prime contractor Salvation Army, which is a framework for identifying, referring potential victims of modern slavery and ensuring they receive the appropriate support. It offers victims access to specialist tailored support for a period of at least 45 days while their case is considered. Brother Malachy added as an example a Vietnamese man they are currently supporting. He was severely traumatised and on anti-depressants, but in recent weeks has improved greatly and a smile has returned to his face. But he and Miguel also reflect ruefully on one of the first Vietnamese they helped, who fled after staying just one night – back to the traffickers possibly fearful of the threats that had been made to his family back home. They later learned he was subsequently rescued from a ‘cannabis farm’ in another part of the country. They also recall another UK victim of modern slavery who came to them after 18 years of servitude with one family. The victim had been exploited not only in the UK but also abroad. “Traffickers are manipulative: they coerce the victim and often threaten the victim’s family, even vulnerable elderly relatives, to keep the victim in subjugation” said Miguel. People often arrive at Olallo House with just a plastic bag, with virtually nothing in it. So providing clothing is an essential first step. But where to shop? Olallo Services are adamant to avoid high street chains that don’t have a clear ethical policy on where cheap garments come from and how workers who produced the clothes are treated: “How can you morally justify spending a pound on a tee-shirt and not question whose fingers were exploited to make it in another part of the world?” asks Miguel. Recent research by the Arise Foundation revealed the scale of anti-trafficking work being done by religious congregations, often under the radar. Saint John of God Hospitaller Services hopes that by sharing details of its work for the most destitute, other congregations will lend their support – offering skills or services, financial support or the use of properties. One Sister currently goes in at weekends to cook for residents; the Olallo Services would welcome other Religious who have language skills, experience of teaching English, or healthcare experience to come and help them treat the poorest of the poor with dignity, respect, compassion and justice in a Hospitaller manner.